There is the assumption that a person can be said to understand a work of art when he or she ‘finds something’ in the subject: about what has been seen and portrayed. Like when someone says that a painting is ‘beautiful’ or ‘good’, the process of perceiving meaning in a work of art often ‘lapses’ in the empirical, simple and normative process of pictorial communication: to the effect that what is captured through the eye is the most important thing. Art is always thought to bear a message, and the work of art, to function as an intermediary for the artist who delivers it. These days, in the midst of the diversity of latest mechanisms of artistic production and consumption, we still encounter ‘direct’ pictorial communications of this kind as the dominant strategy in creating and reading works of art. Even so, I tend to understand the work of Filippo Amato Sciascia as something that transcends the aforementioned categories, especially if we look at his series of artistic journeys as the process of an intensive, comprehensive and sustained search. Working with a variety of media – especially video, painting and installation –I think Sciascia has arrived at a practice that surpasses the boundaries of art as mere retinal object. His search process deals not only with visual perception, but conceptual understanding and action. If human visual perception has an anatomy, then Sciascia’s works not only play with that anatomy, but at the same time attempt to provoke further stripping, and at the same time, dissection. These works call for a more expansive reading, beyond the physical manifestation our eyes can see. Over the years, the works of Sciascia have shown consistency and loyalty to a struggle with the problematic of reality and representation. This is evident, for example, in the series of works called Video <> Painting Kadek (2003-2005), which juxtapose the concepts of looking (painting) and watching (video) in interesting ways. We are faced with the perceptual tensions between forms that are static/ still and in motion; between oil paint and pixel projections; between the ‘auratic’ and ‘post-auratic’; between the ‘magical’ and the ‘hollow’. Today, the logic of art – as a medium that carries with it the ‘burden’ of art history – has been radically updated by a culture of spectacle. The project, Video <> Painting, compellingly underlines the new relationships created between eye ↔ camera, and painting ↔ video clip. These works not only pose problems specific to the art of painting, such as how the creation of colors, lines and forms has shifted due to the discovery of pixels and the digital screen, but also, to changes in the visual representation and perception of reality brought about by the technology of the media: the characteristic issue of 21st century global society. Up to now, Sciascia has much explored the pictorial tensions between painting and the imaging technology of the new era, to constantly question the art of painting as a practice, not only to offer representations, but also to address the philosophical issues specific to this medium. The Video <> Painting Kadek series is an important milestone in Sciascia’s oeuvre, because ever since then he has continued to make the commuting transitions or crossovers of these media a typical point of reference in processing his art projects. In his various exhibitions, Sciascia has placed painting, video and photography in triadic sets that mutually complement one another. This would be an impossible stance for him to take if he did not truly understand the character and history of each of these media. Sciascia’s works largely display cinematic/photographic imagery re-depicted on canvas. If, in enjoying paintings, it is rare for us to be burdened by the concept of the ‘passage of time’ as we are when watching a video with a specific duration, it is precisely this element that Sciascia manages to bring to the surface of the canvas. Using a special technique, he whitewashes the canvas surface with a moisture-prone material, then lets it crack and break up naturally before painting on it. In this process, Sciascia engages unexpected, all-natural interventions in his artistic creation. He never really knows what form the cracks will eventually take. His paintings transform the invisible concept of ‘time’ into something that is palpable and clearly recorded as a trace. Even without identifying the true object of his painting, the fissured effects of the painting bring us face to face with the terrorizing issue of ‘transience’, yet still leaving it unexplained in words. I am immediately reminded of old paintings in museums, or domestic objects in an old man’s house, decayed by time: as if the paintings were dragging me into a past whose historical narrative I do not know. On the cracked or broken surfaces of these canvases, Sciascia renders a variety of photographic images — often in monochromatic colors, with strong nuances of black and white. He frequently depicts objects he has recorded himself with a still photo or video camera: human figures, animals, buildings, landscape. Sciascia believes that by transferring a cinematic/photographic image onto canvas, he has already brought a meaning to the existence of a given object, by distancing it from the stereotypic memories that emerged when he first recorded it. Although they make use of a diverse range of idioms particular to photography and video, Sciascia’s paintings tend to stay away from the presentation of an empirical and objective reality. I see this as his artistic response to the logic of the mass media, which treat photographs or video recordings as documentary objects that always possess a direct connection with reality. The objects that appear in Sciascia’s works seem to refuse detailed or accurate identification. Apart from depicting them solely in monochromatic colors, the process he uses to transfer the photo and video images into painting is like a method of deconstruction: he lets go of all the relational qualities of the object’s meaning, intervenes, reveals unexpected distortions, then places it in a new semiotic domain, as yet unnamed. The series of works Sciascia has created since Video <> Painting Kadek show an interesting evolution. His exploration of visual issues has gradually shifted toward a search for the essence of ideas that are highly subjective. Robert C. Morgan notes a shift toward a more lyrical, poetic and open visual tendency in the work Sciascia did on Trinacria (2007 – 2008), a project he sees as the culmination of the three previous series of works – For Your Consideration Only, Fall/Rising and Sophia (2006). Further, Morgan writes about how Sciascia let go of the fantasy aspects, then approached the issue of the uncertainty of representation, which is precisely what underlies his artistic concept in transferring images and ideas through the media of photography, video and painting. Meanwhile, curator Enin Supriyanto, in his introduction to the exhibition, 1571 CARAVAGGIO 1610 (2008) remarks at great length how Sciascia’s obsessions with the medium of painting and the works of Caravaggio have produced a series of works of appropriation that explore the problems light in a unique fashion. 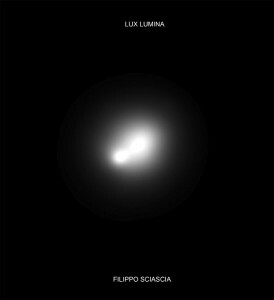 I mark this exhibition – Lux Lumina (Luminous Light) – as an important meeting point of the various series in Sciascia’s artistic journey. For a long time now, he has been interested in light, because of the importance of this element in the various art media with which he has engaged. From the time the (Western) painting began dealing with reality and precision, painters have applied a variety of methods to capture and transfer light onto canvas. In each period, light has been brought forth by different means and modes of thought, according to the spirit of the times and the philosophy of the era concerned. In the works before and during the Renaissance period, for example, light and dark contrasts were meant not only to evoke the illusion of three dimensionality on a flat plane, but also often functioned as a metaphor for divinity. Meanwhile, in Impressionism, changes in the intensity of the light falling on the surfaces of objects were manifested through colored brushstrokes representing the movement of time; some theoreticians link the principle of this ‘ism’ with James Maxwell’s theory of light as electromagnetic waves consisting of a variegated color spectrum. 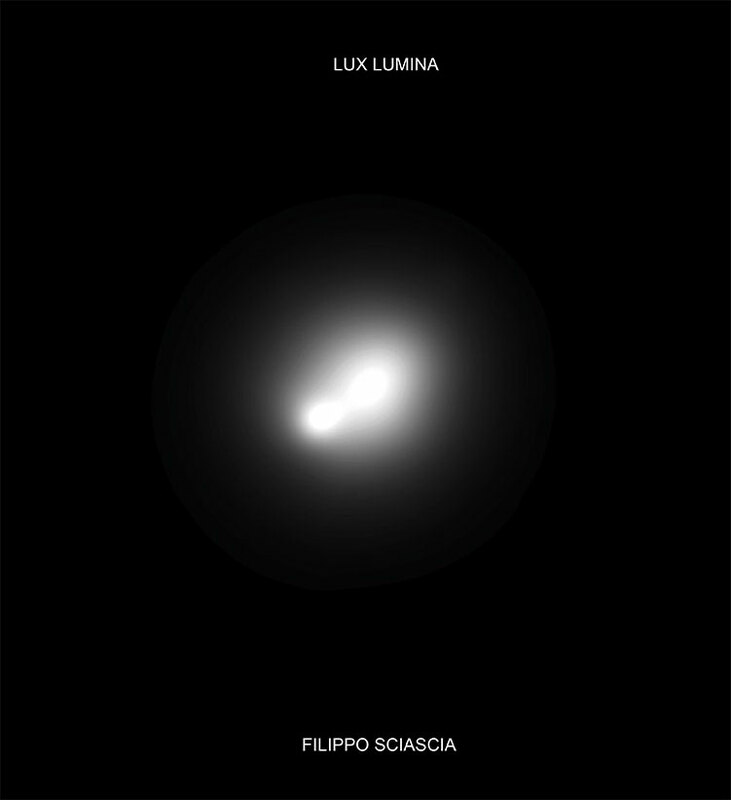 Visually, the works of Sciascia in Lux Lumina really do portray light in its capacity as a visual element in photography and video. Photography and video can never be separated from the aspect of light (the connotation of light is in fact inherently contained within the term ‘photography’ itself; photography = light writing). From the invention of the technology of the pinhole camera up to the creation of the digital camera, the photographer and the filmmaker have always been called upon to control and manipulate light, to be able to endow objects with the desired mood. Beyond that, we also know that light is not only imperative to make this world visible and real, it also functions as a source of energy for all forms of life. In various religious faiths, light is understood and depicted as a symbol of goodness. We may also recall, from the world of philosophy, the metaphor of ‘enlightenment’ as a leap forward in human civilization. All of these understandings inform the underlying concept of Sciascia’s works in this exhibition. In facing the Lux Lumina works we can still see various images in Sciascia’s unique mode of expression: absorbing, poetic, at the same time, enigmatic. In some of the paintings, the contrasts among the objects (human figures, animals, things) struck by light and dark areas are so stark, as if to restrict our desire to further explore the various details and catch the objects in the painting more clearly. The light is not there to ‘illuminate’ our view of the objects portrayed; on the contrary, it blocks our vision. In looking at the paintings, we become aware that light cannot always help us to understand things. The glare of light on Sciascia’s paintings in fact leaves us with uncertainty, forcing us to continue seeking and finding, just as he did in completing the works for this exhibition. That is the point at which the issue of light should not simply be addressed in retinal / pictorial terms alone. Sciascia’s stance this time tends to be holistic: he is defining light precisely as something that is unthinkable, unspeakable, and indescribable. “Light is something and everything that we’re always passionate about!” he once told me. With no pretension to being scientific, rational, or logical, Sciascia’s artistic attitude reminds me of the resoluteness of the quest of a philosopher, who persists in seeking answers to the fundamental questions of life. Duchamp’s words, quoted by Arthur Danto (2003) in ‘The Intractable Avant-Garde’ in The Abuse of Beauty, Aesthetics and the Concept of Art. Illinois: Open Court Publishing, p. 45. Robert C. Morgan, Filippo Amato Sciascia’s Uncertain Allegory, catalogue of the solo exhibition of Filippo Sciascia, TRINACRIA, at Gaya Art Space, 2007. Enin Supriyanto, FIAT LUX: Between Filippo and Caravaggio, the catalogue of the exhibition, 1571 CARAVAGGIO 1610 at Valentine Willie Fine Arts, 2008.